The following is an excerpt from the Independent on January 31st, 2007. In addition to the new left turn lane from Gerard Avenue onto Lower Main Street, a new traffic light was installed, Gerard Avenue was widened and the curb and sidewalks in the area were restored. Also, a new access driveway to a building owned by the Garden State Parkway was completed on the north side of the intersection. This new driveway will replace the old one on Washington Avenue, which is scheduled to be vacated, according to the county. The project cost $406,429 and was jointly funded by the Garden State Parkway, the county and Aberdeen. The work was performed by Green Construction Inc., South River. Umm . . . Not quite. First, let’s review the actual costs of developing the intersection and installing a new access road for the few highway workers who regularly use the GSP facility. The reported $406,429 only refers to the first estimate for construction, not the actual construction costs (which had already been revised upward the prior year). Nor does that number include the engineering plans or purchasing and demolishing a house to make way for the access road. Contrary to the article, all costs were assumed by Monmouth County and New Jersey State except for the one not listed; that demolished house no longer pays property taxes. County officials tell me the intersection would likely have cost $350,000 - $400,000 if not for the access road that was built solely to divert the highway workers from Washington Ave. As can be seen from this aerial view, the state and county spent around $450,000 to spare five homes from the occasional highway vehicle. Next year, the county is slated to expand the Lloyd Road – Rt. 34 intersection at a cost of $2.5 million. The ShopRite and Stop & Shop plazas will be charged a special assessment tax of half a million dollars because of the benefit they’ll receive from the expanded intersection. How much did the residents of Washington Ave. contribute to the construction of the access road? Zero. Why would the state and county spend $450,000 to spare a few homes some minor traffic? Because the Honorable Councilman Vincent Vinci resides on Washington Avenue. Yup, the same Councilman Vinci who received free land from the county and the township. The same Councilman Vinci who was paid “consulting fees” to participate in his own re-election campaign. This same Councilman Vinci petitioned the county to spend $450,000 to divert a few vehicles from his quiet street. He even got two "Do Not Block Intersection" signs, a novelty in Aberdeen, installed at the entrance to Washington Ave. If only he showed the same concern for his constituents. I realize I’ve been picking on our dear Councilman Vinci quite a bit so I’ll make him this offer – if Councilman Vinci agrees, for the rest of the year, to refrain from parking in the handicapped spot when traveling alone to Town Hall, I’ll refrain, for the rest of the year, from targeting him in any of my articles. Do we have a deal? >>> Read more! Apprenticeship, internship, training program, entry-level position, whatever you call it, I’m a fan. Jobs provide teenagers skills, experience, good work habits, and industry contacts. Jobs can also expand a teenager’s horizon, raise motivation, and teach the value of money earned. With the Greater Aberdeen Garage Sale looking to become a minor hit (over 40 houses registered so far – great thanks to everyone who helped, I’ll be posting a special thank-you piece after the event), it’s time to initiate the next project – Teen Jobs. Matawan-Aberdeen has some excellent companies from Altered Image to iVoice to PacificHealth Laboratories. We have a large population of bright, motivated teenagers. And we desperately need a skilled workforce. Sounds like a marriage made in heaven. My company has been slowly developing an in-house project called BiotechScienceNews.com. Once you get past the name, it’s a pretty cool site that tracks and promotes the Life Science field. We’re hoping to have an “alpha” launch in two months to get some user feedback, go to “beta” a few months after that, and be live early next year. My immediate need is for a graphic artist to give the site a clean, professional look. I’m interested in hiring a couple of freelancers who are skilled in Photoshop. These are short-term positions that could be leveraged into long-term assignments. Compensation will often be project based but, in the beginning, freelancers should expect $15 per hour. This is a “virtual” position, so freelancers will be responsible for having a computer and internet connection. I would also like to start a student-produced newspaper that operates independently of the school district. The newspaper, published monthly, would work in tandem with a Matawan-Aberdeen profile on MySpace and Facebook. This project should be financially self-sustaining. Any profits would be distributed among the newspaper staff. Ideally, the school board would take notice and actively work with the Chamber of Commerce to encourage other local businesses to offer internships. In the meantime, it’s my way to make a small contribution to our community. Additionally, if any other businesses would like to post an internship position, please contact me. If there’s enough interest, I can launch a separate jobs posting site. If anyone is interested in any of the above, please email me at aberdeener@gmail.com. I can’t take everybody but I will try to respond to all inquiries. I look forward to hearing from you. >>> Read more! I am repeatedly amazed by the number of people who clip coupons, drive the extra mile to save two cents on a gallon of gasoline, and comb through the internet to find the absolute lowest price, but won’t take five minutes once a year to vote on the school budget and BOE candidates. When asked, they all have the same answer – “It doesn’t matter.” Voting does matter but I understand their angst. The will of the majority is no longer being served. First, some quick facts. Over 20,000 people in Matawan-Aberdeen are eligible to vote but less than 2,500 cast a ballot. The average household spends about $4,300 a year in school property taxes. Despite the school budget being defeated for seven consecutive years, school property tax hikes continue to outpace both inflation and wage growth. As costs rise, academic performance stagnates. In last year’s Math HSPA exam, nearly 30% of our eleventh graders couldn’t correctly answer half the questions. Is there accountability? Not much. One administrator (likely a principal) didn’t get his raise this year (and probably for reasons unrelated to low test scores). In the past ten years, the district hasn’t taken any action against a single tenured teacher. Then there’s the question of whom the Board of Education serves. It seems inconceivable that 100% of the board would knowingly support a budget that a majority of their constituents oppose. Now the BOE has been instructed by Aberdeen Township and Matawan Borough to cut $500,000 from the budget. If you thought that meant cutting spending, think again. Of the $500,000 cut, $375, 000 is for a roof on the administration building that needs to be replaced. In other words, the district didn’t cut capital spending; they postponed it and, in doing so, increased the maintenance cost on a roof that needs to be replaced. Only $125,000 in operating costs (0.2%) was cut from a $63.4 million budget. That the township, borough, and school district would so blatantly reject the will of the voters creates the appearance of a conspiracy, a view buttressed by scheduling their public meetings on the same night to reduce press coverage. It’s equally troubling that a month after ratifying the teachers contract, we still have no clue as to any of the provisions. The board attorney maintains the district should not disclose any details while the contract still undergoes legal finessing. Nonsense. Both the school board members and the teachers union members ratified a memorandum of understanding. There’s no reason why the public can’t see what they ratified. At present, the teachers contract may not be available for another two months, i.e. until summer recess. Another major step is the superintendent’s decision to introduce Everyday Math to all grade levels and begin teaching algebra in seventh grade. This is the first step towards raising academic standards beyond the minimalist state requirements. There’s also hope that the board will begin using objective standards to measure and reward the superintendent’s job performance. Board President Pat Demarest has begun approaching the community, including myself, for ideas to improve the district. Despite my criticisms, I’ve even been approached by board members Gerald Donaghue and John Barbato to open new lines of communication and tackle shared goals. I feel a sense that, despite the election results, the board priorities are shifting. Board members live here, too, and they see their friends and neighbors becoming better informed and more demanding. Once upon a time, a school board member’s legacy was based upon his years of service and the people he personally helped. That’s no longer the case. A board member’s legacy is now entwined with the school district’s performance. The only way to build a legacy is to build the school district. Yet, voter apathy could doom these reform efforts. Real change entails risk, political fortitude, and community support. Voters need to know that change is afoot and that they can make a difference. The best way to do that is to engage the voter. At last night’s board meeting, a local teacher asked the board to consider research showing high school students are more aware and perform better when classes begin at 9AM. The board respectfully listened, thanked him for his comments, and it ended there. The speaker was given no expectation of a follow up. Former board member, Ken Aitken, suggested using Citizen Advisory Committees. I’m not interested in toothless committees. I would prefer Executive Committees. Each executive committee would be chaired by a senior administration official or board member and consist of local residents recruited to serve. We’d have computer experts on the executive technology committee to review technology curriculum, purchases, budgets, strategy, etc. We’d have accountants and financiers on the executive budget committee. Builders and contractors on the executive building committee. Media experts overseeing public communication. College professors on curriculum sub-committees. There would be committees for special education, athletics, nutrition, security, transportation, etc. And these committees would have teeth. Every committee will have the right to submit a proposal for the board to review and vote upon. That means every proposal will get a public airing and board review. Voters must become stakeholders and parents must transform from bystanders into participants. Our school mission should be to empower parents to determine the best education for their children. I believe our school district is ready for the change. >>> Read more! Like all municipalities, Aberdeen Township frequently awards contracts for professional services in a no-bid process. After all, you wouldn’t hire a lawyer simply because he was the cheapest. The vast majority of vendors providing professional services were selected based upon ability, reputation, and cost. However, a large number, who are nonetheless competent, appear to have been awarded contracts based upon their links to Norman Kauff. Below is a list of current vendors with clear ties to Norman Kauff. This, in itself, does not imply that they have done inferior work or overcharged the township. But it does beg the question of whether the township could have made a better choice. CME Associates, Township Engineer – As previously detailed, CME Associates is the single largest contributor to the Aberdeen Democratic Executive Committee, a local political organization controlled by Norman Kauff through his wife, Judith. Coppola and Coppola, Township Planner – Also a significant contributor to the Aberdeen Democratic Executive Committee. Daniel McCarthy, Township Attorney – His firm, Rogut, McCarthy, and Troy, have Norman Kauff on retainer. McCarthy also serves Hazlet and Manalapan; both municipalities had earlier retained Norman Kauff. Marc Schram, Public Defender – He maintains his practice at Airport Plaza, the strip mall owned by Vic Scudiery, Chairman of the Monmouth Democratic Party. Norman Kauff maintains an office at Airport Plaza as well and sometimes retains Schram to represent him. Marc Leckstein, Planning Board and Zoning Board Attorney – In addition to being a contributor to the local Democratic Party, was once Norman Kauff’s law partner. Allen Falk, Township Prosecutor – Not only a donor to the local democrats, like McCarthy, he too has been retained by Manalapan, Norman Kauff’s old stomping grounds. Tom Fallon, Township Auditor – His father, a former treasurer for the Monmouth County Democratic Party, donated to the local Democratic Party until he went to jail for bribing a public official. Tom's office is at Airport Plaza as well. Bill Parness, Public Relations – As stated on his website, he began serving Aberdeen in 1999, the year after Mayor Sobel took office. He’s also Norman Kauff’s neighbor on Justice Lane. Being a friend of Norm isn’t a disqualifying factor, nor does it suggest that the vendor has engaged in any impropriety, but Norm sure does have a lot of friends serving the township. >>> Read more! My preferred modus operandi is to present an issue and then propose a possible resolution. The objective is not to promote my viewpoint but to encourage others to share theirs. Let the best ideas rise to the top and hope the “powers that be” take action. However, there is one issue regarding our school district which I consider to be the most important, the most urgent, and the least mentioned. Unfortunately, all my ideas are little better than the status quo. My only hope is to spark a public debate that will provide the answer. What is our school district’s mission? The non-profit organization exists to bring about a change in individuals and in society. The first thing to talk about is what missions work and what missions don't work, and how to define the mission. For the ultimate test is not the beauty of the mission statement. The ultimate test is right action. . . Here is a simple and mundane example - the mission statement of a hospital emergency room: "It's our mission to give assurance to the afflicted." That's simple and clear and direct. Or take the mission of the Girl Scouts of the U.S.A.: to help girls grow into proud, self-confident, and self-respecting young women. There is an Episcopal church on the East Coast which defines its mission as making Jesus the head of this church and its chief executive officer. Or the mission of the Salvation Army, which is to make citizens out of the rejected. Arnold of Rugby, the greatest English educator of the nineteenth century, who created the English public school, defined its mission as making gentlemen out of savages. My favorite mission definition, however, is not that of a non-profit institution, but of a business. It's a definition that changed Sears from a nearbankrupt, struggling mail-order house at the beginning of the century into the world's leading retailer within less than ten years: It's our mission to be the informed and responsible buyer-first for the American farmer, and later for the American family altogether. Almost every hospital I know says, "Our mission is health care." And that's the wrong definition. The hospital does not take care of health; the hospital takes care of illness. You and I take care of health by not smoking, not drinking too much, going to bed early, watching our weight, and so on. The hospital comes in when health care breaks down. An even more serious failing of this mission is that nobody can tell you what action or behavior follows from saying: "Our mission is health care." A mission statement has to be operational, otherwise it's just good intentions. A mission statement has to focus on what the institution really tries to do and then do it so that everybody in the organization can say: This is my contribution to the goal. . .
One of our most common mistakes is to make the mission statement into a kind of hero sandwich of good intentions. It has to be simple and clear. As you add new tasks, you de-emphasize and get rid of old ones. You can only do so many things. Look at what we are trying to do in our colleges. The mission statement is confused - we are trying to do fifty different things. It won't work, and that's why the fundamentalist colleges attract so many young people. Their mission is very narrow. You and I may quarrel with it and say it's too narrow, but it's clear. A hero sandwich? This is more like a buffet. These same words could be stamped upon any educational facility from nursery to space camp. Worse, the statement doesn’t even reflect our schools’ objectives. Read the statement again. Our mission is only to “provide” services and give children the “opportunity” to learn. That’s like a library fulfilling its mission even if nobody bothers to read a book. Allow that mission statement to bounce around your head some more. Our students could be illiterate and we would still have fulfilled our mission of “providing” the best services. After all, if a student chooses not to learn, that’s his or the parents’ fault. Our only responsibility is to give him the “opportunity” to learn. Our entire school district, with over 3,800 students, has only one physics teacher but that’s okay because he gives a good class and students have the opportunity to learn. The fact that few students actually learn physics is not our problem. Nor is there any conflict in having twice as many substance abuse coordinators (4) as we do chemistry teachers (2). Nor does the mission statement differentiate between calculus and bowling. Any mission statement that does not convey any responsibility to the school staff that children actually learn is not a mission statement. It’s a slogan. Most of my business involves developing web-based applications. The process is always the same. First determine your goals and then the simplest means to achieve them. Build everything to accommodate the user and the client so that everyone gets what he wants and needs. So, working backwards and following Peter Drucker’s advice, let’s see if we can craft a mission statement. One caveat – we are not trying to avoid controversy. The people who devised the current mission statement weren’t stupid, they were political. They fashioned a statement that seemed to say everything but actually said nothing and offended nobody. Step One – What’s the Final Product? Simple question. We toss our kids into the school system with the barest social skills, a simple vocabulary, and the most basic understanding of their surroundings. Thirteen years later, what do we get back? Here’s a corollary to the question – Whom do we ask? The students are children, not adults. What role do they play in making decisions that will impact their future? Perhaps we leave that question to the parents to decide? For me, as a parent, I know what I want for my children – To be happy and healthy and possess the desire and skills to make this world a better place. By the time my children complete high school, I want them to have mastered three skills – the ability to create, communicate, and analyze. To create – to dream and make it so. To communicate – to share a vision with others. To analyze – to understand a situation in all its complexities, ask the right questions, and develop a method towards solving the problem. What’s the final product? First, I want my children to be happy and healthy. Though I’m a poor athlete, I love playing sports. (In my circles, we define a bar mitzvah as the age when a Jew realizes he’s more likely to own the team than play on it.) I think it’s a travesty that sports are not considered central to a student’s academic career. Multiple studies have demonstrated that athletics are a significant contributor towards physical, social, and intellectual development. For happy and healthy children, I would ensure they are engaged in athletics. Next, I want them to be inquisitive, be confident, and have a strong work ethic. For this, I would want them involved in projects where they create something from nothing; to work hard and then relish their achievements. Next, I want them to master at least two languages, to describe an idea, debate a concept, write a story, or inspire others. They should be reading and writing great works of literature. Learn public speaking and debating. Lastly, I want them to have the needed analytical skills to recognize problems, understand their intricacies, and solve them. The next generation will face great challenges and make great achievements – political, economic, environmental, and scientific. We should have current event classes where the students are required to investigate, research, and debate the issues. That means we also need to ensure they have the mathematical and scientific underpinnings to understand and evaluate conflicting arguments. I would also require that each student, prior to graduation, produce a “masterpiece” similar to what an apprentice needed to accomplish before being admitted to a guild. So, having described what I want for my children, what’s the school’s role? What’s the mission? The mission statement needs to be simple, clear, memorable, and operational. Every district member should be able to recognize how his role fits into and contributes towards the school district’s mission. My ideas are poor but hopefully instructive nevertheless. To develop productive members of society – Rejected because we could simply teach everyone how to drive a truck. To teach each student according to his abilities – Rejected because I don’t want the school thinking our students are average and then teach to that level. To provide our students sufficient skills and knowledge to become whatever they choose – Rejected because people don’t miss what they can’t appreciate – i.e. white truffles, Shakespeare, or calculus. To produce scholars – Rejected because most people don’t want to become scholars. To create an environment where students can excel – Rejected for the same reasons we’ve rejected the present mission statement. To equip each student with the skills and knowledge to succeed at living – Rejected because it’s not simple and clear but I think it’s close and by far the best of my suggestions. So, let the debate begin for the $63 million challenge – What is our school district’s mission? >>> Read more! Old Bridge has OBTV-14. Keyport has CKHS-TV. Middletown has Channel 20. Matawan-Aberdeen has Huskievision. Is it worth the cost? Depends on whom you ask. Can we do more for less? Absolutely. Can we entrust the school district to create a viable television channel? Now you’re being silly. As for me, I want a husky Huskievision. Determining the cost of Huskievision is difficult. There are no employees dedicated solely to managing Huskievision. Most of the equipment has been purchased. Nor are there any licensing fees. But that doesn’t mean our school district is getting a free ride. There are labor costs, equipment costs, maintenance, depreciation, and space usage. Last year, the school board appropriated $9,000 just for proposals on converting the TV studio into an instructional facility. I would guess that $200,000 a year is overly conservative. That translates into slightly under $20 per year per household. For those who watch Huskievision, that may seem reasonable but the vast majority of people don’t. Huskievision, broadcast locally on channel 15, is specific to our district, is only viewable on Cablevision (not satellite or Verizon Fios), and does not provide programming schedules to the cable operator, rendering it difficult to record on digital video recorders. Of those people that do have Cablevision, most have high speed internet access as well; meaning they can watch streaming video presentations on the school website, such as BOE meetings. We have no way of knowing how many (or how few) people watch actually watch Huskievision but one indication was the lack of complaint when the channel stopped broadcasting popular soft rock. Less than 10% of airtime is dedicated to actual programming. The rest of the time is filled with public service announcements and background music. Cablevision, under pressure from the music industry, forced the district to shift to royalty-free music. The change went virtually unnoticed within the community. Another sign of viewership is revenue. During the 06-07 school year, Huskievision had only $6,020 in revenue. That’s about a buck-sixty per student. Naturally, the school is not in any position to manage a television channel but having a local channel is a great asset. The solution is to give the school oversight but assign day-to-day management to someone else. Student Group – Create a student group to manage the enterprise. The students will be overseen by a faculty advisor and be allowed to participate in a profit sharing plan. Community Group – Establish a community organization to manage Huskievision along the same lines as the student group. Lease Huskievision – Simply lease the channel to the highest bidder while retaining 20 hours of weekly airtime for district programming. Can any of these groups make Huskievision profitable? Actually, they all can. The major expense of Huskievision is the studio itself. We could rent time in a TV studio from one of the neighboring townships. Or we could do without a TV studio completely, a la Blair Witch Project. A high end Mac, some video editing software, and we’re good to go. Anybody who’s watched Huskievision already recognizes we’re not producing Good Morning America. Increase programming – Get local businesses to sponsor “How-To” shows. For example, the ShopRite could sponsor food programs, the Home Depot could sponsor a home improvement show, Autozone could sponsor a car fix-it program, etc. The channel could host seminars on producing programs and we could launch our own TV series. We could also have a local news show. Since the labor is mostly free, the shows would cost close to nothing to produce. Stream all programming over the internet - Sponsors are interested in eyeballs and the internet would allow them to combine shows with promotions. Participate in revenue sharing with neighboring districts – Home Depot might not be interested in Matawan-Aberdeen, but they would be interested in Matawan-Aberdeen, Keyport, Old Bridge, and Middletown. Submit program schedules to the cable operator – People don’t just want to be on TV, they want to be seen on TV. Huskievision is a terrific asset. Let’s stop throwing money at it and build something great. >>> Read more! The inaugural Greater Aberdeen Garage Sale is in three weeks on Sunday, June 1st. So far, we have sixteen registered garage sales. I'd really like to have 25 to consider this a minor success. The more people who participate, the more everyone will benefit, and the more we can promote our community. I'm broadcasting two ads on Huskievision, submitted announcements to local newspapers for the community calendar, and will begin posting notices around town. Still, nothing helps like word of mouth so please tell your friends that the Greater Aberdeen Garage Sale is happening on Sunday, June 1st. I have set up a website at www.AberdeenGarageSale.com. Registration is free. Anyone residing in the Greater Aberdeen area is welcome to participate. The community-wide garage sale will take place annually, rain or shine, on the first Sunday in June. I’ve not checked with other municipalities but Aberdeen Township does not regulate garage sales. If other areas are regulated, please let me know. In the meantime, I’ll do my best to promote the community-wide garage sale. Of course, I’m doing this on a shoe-string budget so I’ll need all the help I can get. Please be forgiving if the site has some bugs. Suggestions for improvement are most welcome. If you are a local resident, business owner, or organization, and would like your website promoted on www.AberdeenGarageSale.com, please let me know by emailing me at Aberdeener@gmail.com or posting a comment on this blog. Spread the word! Sunday, June 1st, is our first community-wide garage sale. >>> Read more! Please make the appropriate corrections to your verbiage. I am the owner of Ciaglia Landscape Design LLC. I have nothing to do at all with any variances, subdivisions and or tax breaks. I work 70 hours a week so that I can do for my children what my father (Anthony Ciaglia the Mason) has done for us. I am not a board member and quite frankly have never attended a board meeting in my life. I am not saying that I do not care about the town, but I spend most of my time trying to grow my business so I can afford to stay here in Aberdeen. Please know that I am not a builder nor am I affiliated with any type of new construction of homes in this town. Should you have any questions regarding my personal or business life, please contact me at anytime. I would be more than happy to interview. Aberdeen’s been good to the Ciaglia family. There’s Joe Ciaglia of VRI Realtors, Joe Ciaglia of Ciaglia Landscapers, and Joe Ciaglia of Ciaglia Builders. All of them have built successful careers through hard work and their fair share of good fortune. But John Ciaglia of Ciaglia Builders has been the luckiest one of all. He has an unbroken streak of winning variances, building on subdivided lots, and garnering tax breaks in Aberdeen Township. Sadly, it seems John’s luck is about to run out. Again and again, John Ciaglia has won the right to subdivide land and build on lots that are too small to accommodate his houses. In 2000, he won the right to subdivide two lots on Church St. into 5 properties, even though each lot would only be 75 feet wide instead of the 100 foot zoning minimum. That same year, the zoning board allowed him to construct five homes on a tract formerly owned by the Cross of Glory Lutheran Church. In 2003, he was allowed to subdivide a property on Atlantic Avenue and build a second house on a 6,250 square foot lot. Then there’s the 7,500 square foot lot on Dolan Avenue. He’s now looking for a variance to convert the corner mother/daughter house on Church St. and Atlantic Ave. into a legal two residence. To assist with any zoning requests, the town council obligingly appointed Joe Ciaglia (I believe of landscaping) to sit on the Zoning Board. At each turn, the public has opposed Ciaglia’s expansion plans on grounds that over-developing the land would detract from the neighborhood and the added tax revenue would be lost to the costs of schooling for incoming families. After all, why have zoning regulations if they constantly get waived for developers. By granting the zoning requests, Aberdeen Township enabled John Ciaglia to buy land on the cheap, subdivide the properties, and build as much as he could. But then the township went one step further. In a town that has the third highest tax rate in Monmouth County, where the locals howl against over-development, where our school district is being overwhelmed by nearly 4,000 students, Aberdeen Township declared all of Ciaglia’s development properties as “vacant land” rendering them almost tax-free. Before continuing, I need to explain a couple of items regarding property taxes. Real estate consists of the land itself, including everything above and below it, and any “improvements” on the land (i.e. houses, buildings, swimming pools, etc.). To determine market value, an appraiser first determines “best use” of the property and then evaluates the property through one of three methods – comparables, income, and cost to build. The township then assesses the property based upon presumed market value. To keep the bookkeeping simple, rather than change a property’s assessed value with each fluctuation in the marketplace, the township maintains a constant assessment but uses an “equalization factor” to determine the ratio between the assessed value and market value. Market value times equalization factor equals assessment. 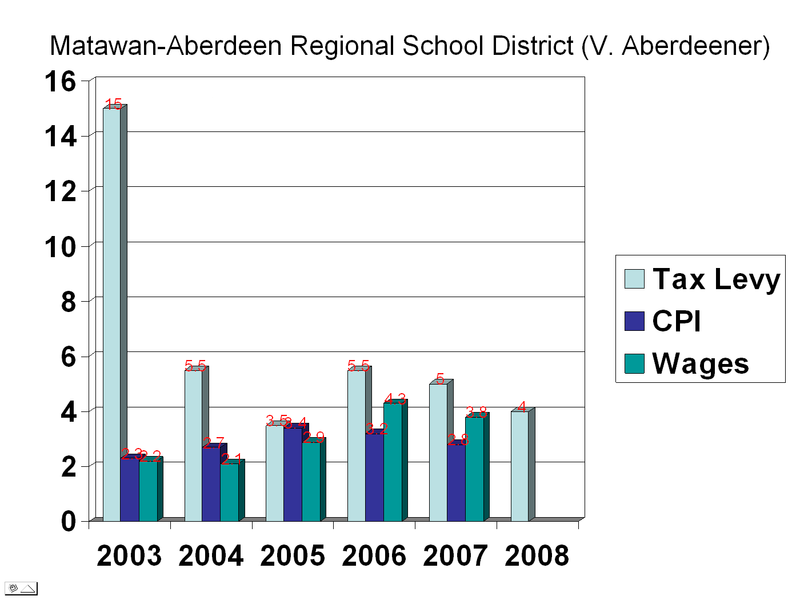 For example, in 2008, Aberdeen Township’s equalization factor is 37.94 percent. A house with a market value of $400,000 would be assessed $151,760. When assessing a developer’s property, we need to first assess the best use of the property and then the improvements. So, let’s say a developer purchases farmland and then applies for the land to be rezoned for residential. The land would be initially assessed as farmland but then assessed as residential property after the zoning change. Regarding improvements, the legal standard is that every developer is assessed full market value once the improvement is “substantially complete”. What’s the definition of “substantially complete”? If a person could live or work in the structure, it’s substantially complete. No need to wait for final touches. Now, let’s look at Ciaglia’s properties. As mentioned, the township allowed him to subdivide two lots on Church St. into five. Have a look at the tax table for the Ciaglia properties on Block 55, Lots 9.04, 9.05, 9.06, 9.07, and 9.08. Notice how they’re all assessed as vacant land in 2002. Flip through the pages and you’ll see that whichever properties are owned by Ciaglia remain assessed as vacant land. There is one exception – block 55, lot 9.07 in 2004. That’s because the property was sold in 2003 but not recorded until 2004. Nor is it proof that it happened again on Oakshades Avenue on block 275, lots 10.01 and 10.02. Or that it also happened on Shadynook Street, block 315, lot 3. But Cambridge Park, that’s proof. Ciaglia purchased land from the Cross of Glory Lutheran Church in 2002 for $250,000. Although he initially intended to build six homes, part of the property was declared a wetland, reducing the project to five houses. Have a look at the tax tables for block 68, lots 16.02, 16.03, 16.04, 16.05, and 16.06. The properties are only assessed at $1660 each. Using the 2003 equalization factor of 67.67%, the township valued all five properties together for $12,265, less than 5% of the purchase price. Basically, the township assessed the properties as if they were still zoned for a place of worship. Even when all the zoning variances had been approved, the Ciaglia lots were assessed for a pittance of the purchase price. Even when all the permits were issued. Even when construction began. And even when construction was “substantially complete”. In 2006, I received the following MLS listing - 10105935, 75 CAMBRIDGE DR, ABERDEEN, NJ - $649,900.00. The listing has since expired but it described 75 Cambridge Dr. as being built in 2005. Then take a look at the tax record. In 2006, it was still being assessed $1660 (a market value of $3670). In 2007, it was assessed as residential property with zero improvements. Only in 2008, has it finally been assessed full value. In 2006, Ciaglia paid $440.95 in taxes for properties worth over $3,000,000. The game plan was a simple one. Ciaglia’s properties were only re-assessed at the issuance of a certificate of occupancy. But builders don’t apply for the certificate until they’re about to sell the properties. Why Aberdeen Township chose to play this game, I don’t know. But then John Ciaglia’s luck ran out. Of the five properties, he’s only been able to sell one; the lots are too small to warrant such high prices in this neighborhood. Then came the housing slump and the credit crunch. Then came Holly Reycraft, Aberdeen’s new tax assessor. Unfortunately for Ciaglia, Reycraft neither knew of, nor was interested in, any “understanding” Ciaglia had with the township. Her only concern was doing her job as defined by law. The New Jersey State Constitution demands that “All real property . . . shall be assessed according to the same standard of value.” (Article VIII, Section 1(a)) There are no exceptions for developers, even in Aberdeen Township. So, one day, Reycraft just happened to be driving down Cambridge Drive when she noticed all the new houses. Back at the township, she discovered an “oversight” in the tax rolls and immediately adjusted the property assessments for Cambridge Park to reflect full market value. Well, John Ciaglia was not pleased at all. He challenged the assessments at the county level and was rebuffed. Now, he’s waiting to make his case before the Tax Court of New Jersey, docket number 000134-2008. Unfortunately for him, the case isn’t scheduled until September. Including his two houses on the corner of Atlantic Ave. and Church St., John Ciaglia is sitting on about $2 million in debt and spending over $250,000 a year in interest payments, property taxes, and upkeep, while watching his properties lose value. Then again, this is Aberdeen. Let’s see if John Ciaglia’s luck turns around. As for Holly Reycraft, pray she doesn’t meet the same fate as former town manager, Stuart Brown. >>> Read more! My granddaddy only raised cows and chickens but even he knew the old saw that a pig in a dress was still a pig. It’s amazing how government can take an excellent idea, grind it through committee, dilute the original concept until it’s barely recognizable, immunize all the participants against any stigma of failure, and then proclaim that any shortcoming is either due to a lack of resources or that the idea itself was flawed. A primo example of this buffoonery is our superintendent’s employment contract. One of the reason’s I’m a fan of Dr. O’Malley is that he fully appreciates his dual mandate to improve our students’ education and to do so without utilizing more resources than necessary. While those two mandates are often in conflict, it’s a challenge that every parent in Matawan-Aberdeen confronts each day. The Board of Education, unbound by any union constraints, provides the superintendent a financial incentive to perform his duties to the best of his ability or, in the common parlance, merit pay. As a capitalist society, we’re firm believers that people try harder when they have a self-interest to do so. Offering merit pay to the superintendent is a fantastic idea. At least it was until the school board got hold of it. In order for merit pay to work, the employee must have a firm grasp of expectations and rewards. In sports, that means filling seats and winning games. In business, that means making money. In schools, that means improving education and controlling costs. Most businesses have a difficult time measuring performance and determining rewards. For the superintendent’s position, it’s relatively easy. We measure three things – 1) Student test scores, 2) People’s desire to send their children to our schools, and 3) Spending and tax increases (including asset depletion) compared to inflation and wage growth. The devil’s in the details but we can certainly get a rough estimate. Keep in mind, the school board is now controlled by the Barza wing, a majority of whom voted against Dr. O’Malley’s appointment. No matter how hard he tries or how much he achieves, Dr. O’Malley can’t reasonably expect any significant bonus. Hence, the entire reason for offering a bonus has now vanished. As if that weren’t enough, the school board then makes a mockery of performance pay by utilizing an evaluation form that reads like a kindergartner’s report card. The first part is a section detailing the superintendent’s objectives and his ability to meet them. Unfortunately, even the objectives are deemed a “personnel” matter and rendered unavailable to public viewing. While the list sounds impressive, in truth it’s no more than the grownup version of “plays well with others”. Chief executive officers are not measured by effort. They’re measured by results. We don’t ask if a superintendent works well with staff and faculty. We track how well he retains the good ones and loses the others. We don’t ask if a superintendent is good with money. We track spending, taxes, and assets. We don’t ask if a superintendent is good with students. We track how students are performing and how much parents want their kids in our district. Furthermore, we grade a superintendent through objective criteria, not by how much the current board members like him. I don’t know which is worse – that the school board uses such a form or that they took it from the New Jersey School Boards Association (NJSBA), an organization whose primary mission is to indoctrinate board members into viewing the school district from the teachers union’s perspective. To that end, last year the state passed the School District Accountability Act, which requires all first-term board members to attend NJSBA “training” seminars each year and all other board members to attend at least one each term. (Can anyone name any other elected representative that’s required by law to attend a “training” seminar each term?) Despite all the programs offered by the NJSBA, they don’t sponsor a single course on improving education or reducing taxes. We’re spending over $63 million this upcoming school year to provide our students a below average education. If Dr. O’Malley can get us into the top quartile of our District Factor Group, I say give him a $50,000 bonus. It will be money well spent and he shouldn’t have to rely upon the kindness of certain board members to get it.